A string quartet is a rare jewel among musical ensembles for many reasons: first, four musicians have to agree to a great deal of their time practicing together. Second, players must adjust to each other’s idiosyncrasies while learning to perform as a single entity. Third, the four must agree on the musical interpretations of the pieces they play. Delaware has such a jewel in the Copeland Quartet. Eliezer Gutman, violin, Thomas Jackson, violin, Nina Cottman, viola and Mark Ward, cello have reached a high point in their ensemble playing since the quartet was formed in 2003 and they proved it with a performance on June 14 at the Church of the Holy Trinity in Wilmington – an acoustic haven for their sound. But it is not just the acoustics which make the gifted group sound so good. The group has established a level of communication that allows them to complete lines of very fast scales in the Arriaga String Quartet in A Major so that one voice simply melts into the next as if one player were pushing a ‘now cello, now viola, now violin button’. And when they played a variation in the Andante movement with pizzicato and forte on the offbeat eighth notes, they were perfectly syncopated. That is difficult for one person to do – try it as a foursome. The concert continued with one of the more difficult quartets in the repertoire: The String Quartet in F major by Maurice Ravel. Sleeves rolled up, the players provided the tone color Ravel painted in the score with fantastic intonation and listening to the chords they created in each movement. The effect of the double stop pizzicati against the legato notes in the second movement was electric. The audience seemed to lean forward to see how it was done. 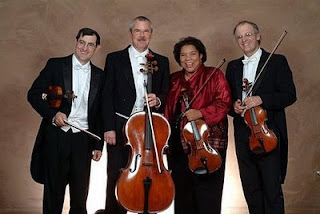 The Copeland will play four concerts at the Church of the Holy Trinity next year: October 11, January 24, April 18 and June 13 – all concerts at 4 p.m.
See www.copelandstringquartet.com for more information.